A medication timing device including a base carrying a circuit with a timing device, a switch for activating the timing device, a signal device activated by the timing device, and a battery coupled to the timing device and the signal device, and a top coupled to the base and covering the circuit. The top is moveable between a normal expanded position and a compressed position in which the switch is tripped. 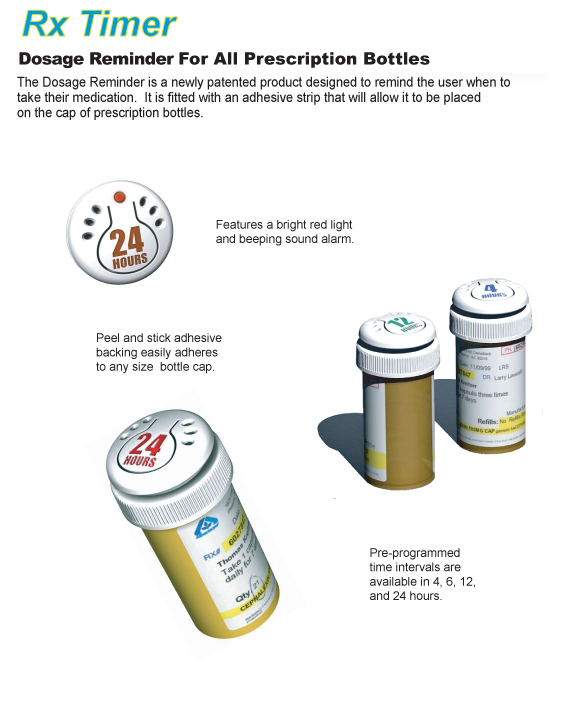 A fastening element fastens the base to a medication container. We are looking to sell this patent. Each year in the United States 125,000 people die from a failure to properly take their medications. This adds roughly $100 billion in preventable hospitalization, emergency room, and physician visit costs. It is estimated that at least 10% of all hospital admissions are a result of this problem. When the average senior in the United States takes about seven different medications daily, it is easy to see how this is a problem, but the problem isn't limited to just seniors. The most common reason people neglect to take their drugs properly is that they forget to. 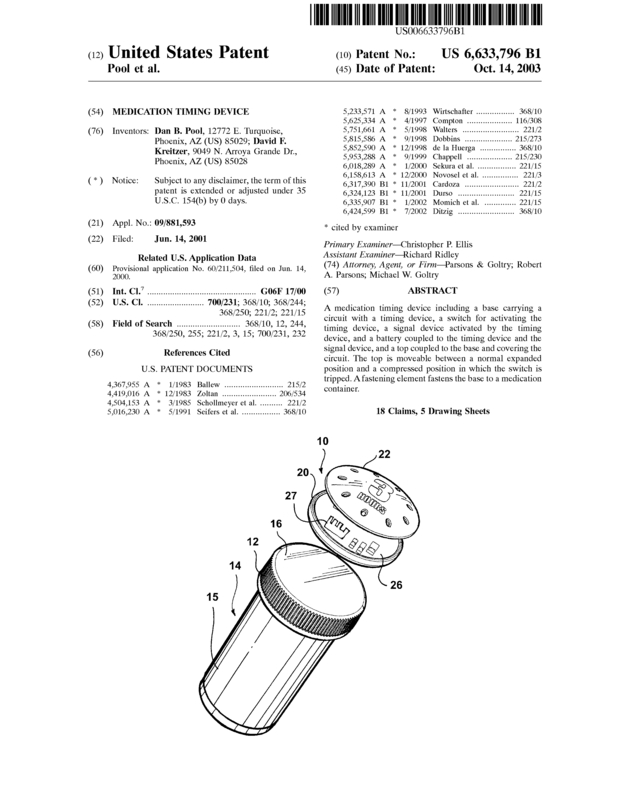 Our medication timing device patent solves that problem. 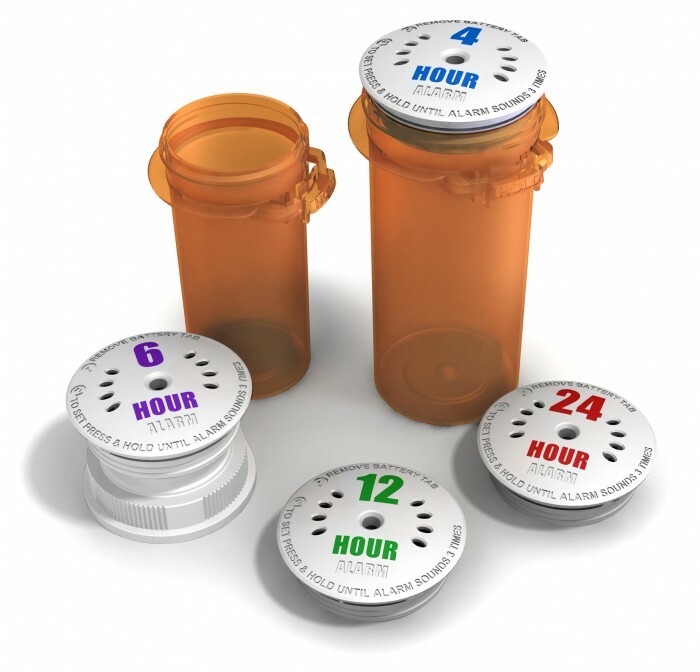 Medication timing devices are currently sold in stores such as Walgreens and CVS, but these devices are difficult to program. 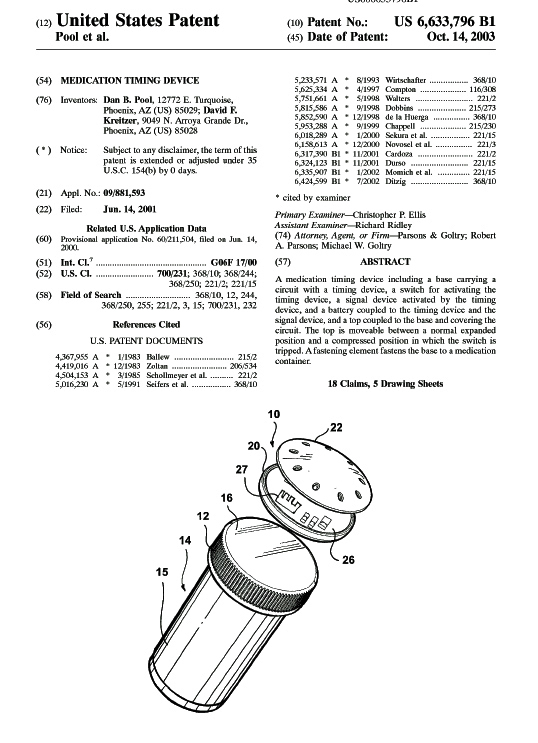 Our patent covers a simple to use medication timing device. Drug stores, retail stores, and pharmaceutical companies are potential marketing possibilities. In addition to this patent, we will also include an additional provisional patent that we have been developing. Page created at 2019-04-25 14:35:24, Patent Auction Time.